a large distance between the maxillary and mandibular arches; may also imply an excessive vertical dimension. an abnormal dental condition in which the anterior teeth in the maxilla do not occlude those in the mandible in any mandibular position. Compare closed bite. (a-per'tog-nā'thē-ă) In the diphthong gn, the g is silent only at the beginning of a word. 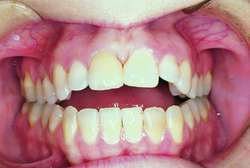 An open-bite deformity, a type of malocclusion characterized by premature posterior occlusion and the absence of anterior occlusion. Synonym(s): open bite (2) . Space between maxillary and mandibular arches. Synonym(s): open bite (1) . n a malformation in which the anterior teeth do not occlude in any mandibular position. 1. seizure with the teeth. 2. a wound or puncture made by a living organism. 3. the position of upper and lower teeth in relation to each other when the mouth is closed. See also biting. trauma caused by teeth and usually heavily contaminated with microorganisms. In countries where rabies is present the additional consideration is to ensure that the biter is not rabid, or if there is uncertainty to decide on whether postbite treatment or vaccination would be desirable. See also cat-bite abscess, cat-scratch disease, fighting. depending on the nature of the insect and the site, the tissue response may be minimal to extensive, particularly when a hypersensitivity reaction is involved. Pruritus is also variable. upper and lower incisors fail to meet when the mouth is closed. upper and lower incisors make contact on their edges rather than overlapping when the mouth is closed. the labial surface of the lower incisors makes contact with the lingual surface of the upper incisors when the mouth is closed. Called also anterior crossbite. the lingual surface of the upper incisors contacts the labial surface of the lower incisors when the mouth is closed. Generally, a normal bite in carnivores. it is often necessary to diagnose that a wound has in fact been caused by a bite. This may be aided by observation of typical puncture wounds, perhaps with extravasations of blood in the subcutaneous tissues, by parallel rake marks, by a matching pair of wounds made by the upper and lower jaws of the biter. 16-20 Very few reported attempts have so far been made to study skeletal characteristics of AOB individuals in Pakistani population; therefore objective of this study was to evaluate the morphologic characteristics of skeletal open bite in Pakistani orthodontic patients and to establish population norms of facial patterns for AOB sample. Evaluating the stability of open bite treatments and its predictive factors in the retention phase during permanent dentition. Nevertheless, studies such as the ones by Tsai, (44) who reports that long-term use of the Essix retainer produces anterior open bite, and Gill et al, (48) who contradicts this last assertion pointing out that there is no relationship between the use of Essix retainer and open bite, as well as other authors, who found no overbite changes when evaluating subjects using both retainer types, (38, 40-45) allow to conclude that, although changes to the molars were found in both treatment groups, this is not sufficient basis to assert that the vertical changes experienced by molars are caused by a tendency to anterior open bite, since anterior and posterior open bite were absent in all the evaluated subjects in both treated groups. Masticatory Muscle Exercise as an Adjunctive Treatment for Open Bite Malocclusions. The effect of posterior bite plane of dento eskeletal changes in skeletal open bite malocclusions. Active vertical corrector treatment--long-term follow-up of anterior open bite treated by the intrusion of posterior Am J Orthod Dentofacial Orthop; 110:145-154, 1996. 2% upper jaw (without change in the jaw shape) Open bite (frontal, vertical disocclusion) 7 3. Skeletal hypertrophy is a common finding associated with cervicofacial CH, and the mandible is frequently affected, resulting in a high incidence of anterior open bite and class III malocclusion [Padwa et al. Abhinav Sinha, head of pediatric dentistry at the New York-Presbyterian/Weill Cornell Medical Center - that's a mouthful in itself - who says one of the most common results of pacifier overuse is an "anterior open bite," which creates a noticeable gap between the lower and upper front teeth. The new and improved SmartForce features in Invisalign G4 will help doctors achieve better clinical results for open bite treatments, more predictable movement of upper laterals, and improved root control for canines and central incisors. Orthognathic surgery or corrective jaw surgery is carried out to correct a wide range of minor and major skeletal and dental irregularities including the misalignment of jaws and teeth, open mouth due to protruding teeth, protruding lower jaw, open bite and receding lower jaw or weak chin. Discussion of anterior open bite dentofacial deformities has been updated to reflect new philosophies of diagnosis and correction, and description of intraoral vertical mandibular ramus osteotomy has been added.